Brookings, SD – The Beef Skill-a-thon, held during the Davison Winter Beef Show challenged youth to show off their beef production skills. Thirty participants from seven South Dakota counties came together and demonstrated their knowledge in beef selection, meats, animal health and identification and beef reproduction. 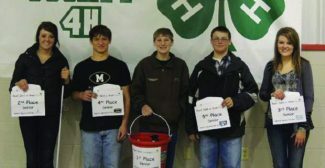 "Youth practiced matching skills by identifying equipment, breeds and variety meats while also learning proper calf presentation during calving. 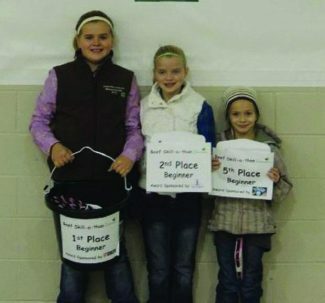 This hands-on learning experience was a great way to highlight youth's knowledge while also teaching them proper animal management skills," said Megan Nielson, SDSU Extension Youth Livestock Field Specialist. Awards for the Top Five in each age group were sponsored by Mitchell area businesses. Thank you to the Mitchell Tractor Supply Company, Mitchell Livestock Auction, Northwest Veterinary Supply, First Dakota National Bank, Pizza Ranch, Village Bowling Center, Logan Luxury Theater and Culver's Restaurant. Top Beginners: 1st place – Maesa Dvorak, Charles Mix; 2nd place – Callie Frei, Charles Mix; 3rd place – Katlin Schlim, Miner; 4th place – Logan Schlim, Miner; and 5th place – Jacee Dvorak, Charles Mix. High Juniors: 1st place – Colton Frei, Charles Mix; 2nd place – Sawyer Naasz, Brule; 3rd place – Hanna Peterson, Miner; 4th place – Sam Podzimek, Davison, and 5th place – Sydney Dvorak, Charles Mix. Top Five Seniors: 1st place – Jonathan Olthoff, Hanson; 2nd place – Kelsey Repenning, Davison; 3rd place – Abby Repenning, Davison; 4th place – Gramm Johnson, Davison, and 5th place – Adam Eirchacker, McCook. Top Two Adults: 1st place – Steve Repenning, Davison and 2nd place – Boyd Dvorak, Charles Mix. SDSU Extension actively works with South Dakota 4-H to provide more learning opportunities like this event across the state. 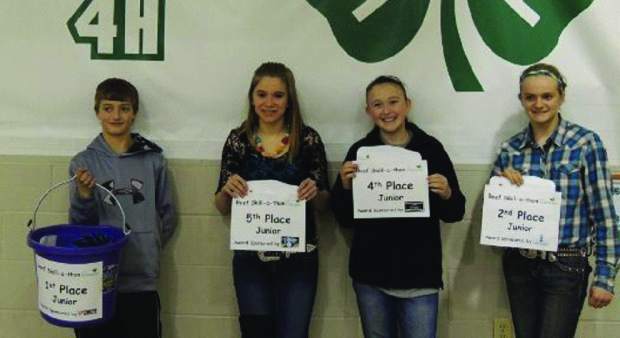 The next event will be held at the Black Hills Stock Show Youth Day on Jan. 26. Youth can compete in the Livestockology Contest which encompasses beef, sheep and swine production practices. New to the 2013 South Dakota State Fair, 4-H and FFA youth can compete in the Goat Skill-a-thon along with the Beef, Sheep and Swine Skill-a-thons.